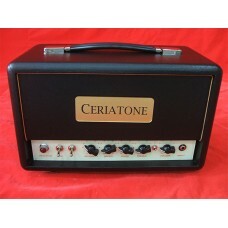 This is Ceriatone's Custom built tribute to the Fender Blackface Vibro Champ boutique guitar amp (1964-1967), an amazing 6 watt amp powered by a single 6V6 with two 12AX7s (preamp and tremolo) and a 5Y3 rectifier. This Champ is built with a special twist! It has a selectable TWEED / BLACKFACE switch, so it's TWO AMPS IN ONE! The classic American amplifiers of the '50s and '60s inspired us to create the, errrrr, American Cla..